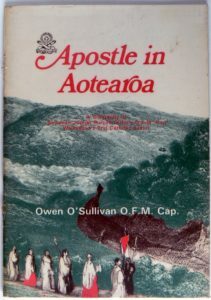 Published in New Zealand in 1977, Apostle in Aotearoa tells the story of Father Jeremiah Joseph Purcell O’Reily OFM Cap., Wellington’s first Catholic pastor. First published by THE WORD PUBLISHERS LIMITED, P. O. Box 66-018, Auckland 10, New Zealand, 1977. You can read or download a PDF of the text of Apostle in Aotearoa here.